It was a fantastic day for the children in Year Five today as they spent the day as ancient Greeks with the help of the team from ‘Portals from the Past’. 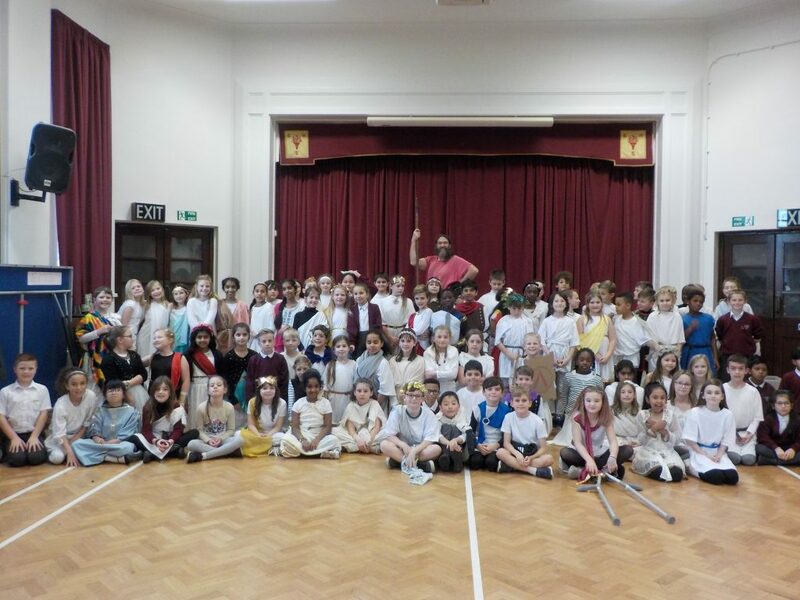 The children all came to school dressed to impress as Greeks and gathered in the upstairs hall where they learnt all about the Sparta and the Athens battle. They then had the opportunity to play a Greek game, complete a jigsaw and compete in a quiz; drawing on all the facts that they had digested throughout the day. In the afternoon the children all competed in a mini Olympics and loved taking turns to throw the javelin! It was a brilliant day which everyone enjoyed. Thanks to all of our lovely parents for helping it go so well by sending the children into school in such great costumes. Meanwhile, in Year Two, the children continued to investigate the life of the author Julia Donaldson. they researched her life and then used the facts to create their own fact files about her and her work. At lunchtime Mr B had a smashing lunch where he enjoyed a very grown up conversation in the company of some boys from Year Six who he had spotted being particularly polite when being served their lunches. Well done boys,, we are proud of you. It was a sad lunchtime though today as we said a fond farewell to Mrs Paterson, one of our much loved Midday Assistants, after six happy years as part of the team. Mr B interrupted play on the KS1 playground and the children all gave Mrs Paterson three cheers as she was presented with a lovely flower arrangement. Thank you Mrs Paterson for all of your hard work over the years. Over in the pool, in the afternoon, the children in 6C enjoyed their final swimming session of the term by taking part in a fabulous fun swim session. ← Layer Marney Tower Trip!